The Botanic Gardens at Kew were formally established in 1759. The sponsor of the project was Princess Augusta. It aimed to create a garden which would "..contain all the plants known on Earth". William Aiton was hired as gardener, and he devoted the gardens mainly to medicinal plants. International fame was brought upon Kew by Joseph Banks (1743-1820), who changed its direction to serious scientific and economic botanical purposes. The architect William Chambers constructed a number of (oriental) decorative buildings at the site. First visited it on the same schooltrip as Westminster. Some 17 years later I went back, mainly to add some better pictures to this site. My second visit was cold and very slippery, and I was almost the only tourist around. From my previous visit I remembered the palm trees and cactuses. Probably that was the dry area in the Princess of Wales Conservatory: still interesting, but when you've just been to Northern Ethiopia like I have, you prefer the real thing. After an hour or so I began to notice something else than nature: the neverending stream of planes that fly over Kew Gardens from or to Heathrow Airport. The last week of March and Spring had arrived in England as suddenly and as unexpectedly as it does every single year. People emerged, pale-skinned, from their houses, blinking in the sunlight like new-born rabbits, turning their faces to the warmth of the sun and casting off layers of clothing as they went. Strolling through the Royal Botanic Gardens in Kew it was momentarily easy to forget that I was in south-west London. Off Syon Vista the south-east Asian magnolias were in full bloom, their milk-white waxy petals stained pink and purple. The Japanese cherry trees scattered a frosting of blossom beneath their boughs. Emerald green parakeets flitted from tree to tree. And in the dripping steam of the great Victorian Palm House my footsteps disturbed an Australian water dragon from his meal of ripe papaya. Despite the profusion of plants from climate zones ranging from the desert to the Alps there is something about Kew Gardens that is inescapably English. And by ‘English’ I mean the England of the mid-19th century as it marched off across the globe waving the flags of ‘science’ and ‘order’. 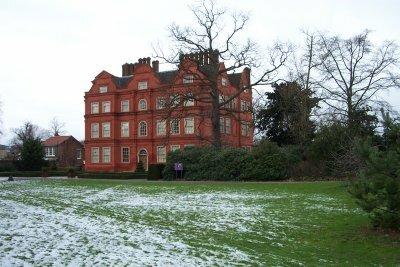 For the grounds attached to the royal Kew Palace were to be the home of the botanic samples brought back from those foreign adventures, the flora of the furthest reaches of the Empire tamed into ornamental parterres and romantic thickets. It reminded me somewhat of the political scientist Walter Bagehot’s quote about the English constitution, that it needed to be both ‘dignified’ (‘to excite and preserve the reverence of the population’) and ‘efficient’ (to ‘employ that homage in the work of government’). And that dichotomy is reflected in the criteria under which Kew Gardens was inscribed as a World Heritage Site. Criteria (ii) and (iv): the grand landscape gardens and architectural features reflect artistic influences and ‘the beginning of movements which were to have international influence’. Criteria (ii) and (iii): a nod of the head to the ‘scientific and economic exchanges established throughout the world in the field of botany’ and the Gardens’ contributions to advances in botany and ecology. The visitor sees the dignified order of the gardens and the showpiece buildings they contain. But the efficient science aspect of the Gardens, the work done here to study and to classify and to protect is just as important. So how does it hold up to other comparable sites? The quasi-natural ‘English Garden’ style certainly found huge favour across Europe in the 18th and 19th centuries but I haven’t visited enough sites to be able to compare and contrast. 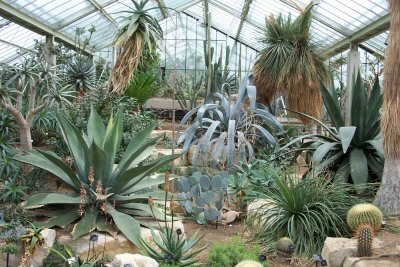 The most obvious comparison is the Orto Botanico of Padova in Italy. Maybe it is due to the scale of Kew or maybe it was just because I visited Kew in March when flowers were blooming rather than November when Padova’s plants were reduced to denuded twigs but I much preferred my experience of Kew Gardens. Certainly, I found more to catch the eye in Kew. 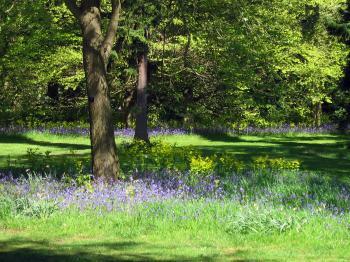 I found it thoroughly enjoyable to wander the beautifully maintained parkland. But Kew’s ‘big hitters’ form a rough spine along its eastern edge, away from the Thames. From south to north these are the ten story octagonal Great Pagoda (one of the oldest buildings here, dating as it does from 1762), the regular angles of the Temperate House (the world’s largest surviving Victorian glass structure), the curvaceous Palm House, the low hedgehog-like Princess of Wales Conservatory and the bijou red-brick royal palace. Perhaps I have mass-market tastes, but the Palm House and Princess of Wales Conservatory were my highlights. The Palm House’s lattice of white-painted wrought iron and dripping and hissing pipework cannot have changed much in appearance since it was first erected in the 1840s. Taking my three-year-old son up the narrow spiral staircase to the balcony overlooking the riot of greenery below I couldn’t help but wonder how many other generations had done precisely the same (indeed, I know that my parents brought me to Kew Gardens when I was 9 years old and though I can’t remember anything of the day it’s highly likely that my own father climbed those steps with me). In comparison, the Conservatory is much more modern, with ten different climactic zones on display under its jagged glass roof, the temperature and humidity in each controlled by computer. I did experience a Narnia-like thrill from being able to step through a door and travel from a sweltering orchid-draped rainforest to a bone-dry agave-scented desert of king-size cacti. Getting to Kew Gardens is a doddle from central London. It has been connected to the city by train almost as long as it has been open to the public: Kew Gardens station opened in 1869. It sits on both the London Underground District Line and the London Overground train routes and is located less than 500m from the Victoria Gate. In fact, it is probably easier to travel to Kew via public transport as car parking provision (by Brentford Gate) is limited and costs £7 for the day. There is free parking on the road and side streets around the Victoria Gate but parking restrictions apply until midday. Entrance is pricey: £18.00 per adult (or £16.50 if you buy online in advance). I do have one weird money-saving tip, though it only works if you are visiting as part of a couple in April. Beforehand, try to find a newsagents selling the BBC Gardeners’ World magazine. Every Spring for the past few years the magazine has included a free card giving 2-for-1 entry to hundreds of gardens across the UK and Ireland. Ours saved us £18.00 on the day. In March 2019 I visited the four WHS in London. Because it is almost imposible to visit some WHS without online ticket/reservation (Westminster Parliament and Abbey) , I decided to buy all my tickets in advance, also Kew Gardens. The advantage is that I saved some pounds with every ticket in expensive London and I walked several times directly inside after scanning the ticket. Kew Gardens is easy to reach with the underground. From the VERY busy King Cross Station I went in 40 minuts to Kew Gardens Station. From there it is a walk of less then 5 minuts to the Victoria entrance (gate). I was there at 9.45 AM and I was the first tourist waiting. Slowly more people joined me and at 10 AM the gate opened. With my online ticket I was in just 10 seconds inside and I went inmediately to my first goal, the Temperate House. The first 15 minuts I had the greenhouse for me alone and I took some nice photos. What a diversity of plants there, all described, it is to much to read it all, but I really liked it. And not forget the architecture of the greenhouse, beautiful ! 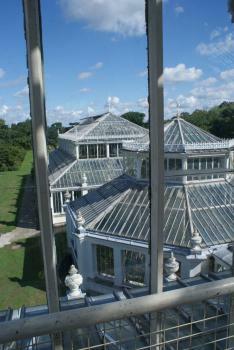 The second goal was the Palm House, also a special greenhouse from outside and inside. After I saw the two highlight without a crowd of people I took a break at the Victoria Plaza. In the next two hours I walked slowly the official route in the parc. Unfortunately the tree walk was closed because of maintenance. At the end of my walk I visited the Princess of Wales Conservatory, a greenhouse with diferent climate zones. After more then 3 hours I was tired and I decided to have my lunch very close to Kew Gardens Station where I saw some market stalls with delicious chocolate bread. And then (14 PM) it was time to go back to the center of London. I looked back on a very nice day and I was lucky that day, no rain ! I should apologize to Kew Gardens that I ever associated it with The Avengers movie (not that one -- the other one you've tried to forget); apparently filming was done at nearby Syon House. Now that I have disassociated the fine Kew greenhouses and grounds with any ridiculous plots to control the world's weather, I can look back at my visit to the gardens with newly-appreciated gravitas. 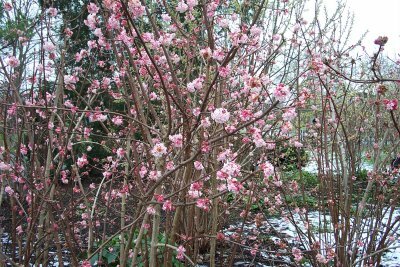 And, in all seriousness, I fully enjoyed my visit to the gardens in the spring of 2009. The gardens claim to have the largest and most diverse botanical collection in the world, and these are on fine display throughout the grounds. I arrived in April, just in time to see great swaths of bluebells showcased throughout the woods. Cherry blossoms and other flowering trees were also in bloom. Within the greenhouses were orchids, water lilies, and a range of plants from alpine to desert climates. I particularly appreciated the engineering of the vast Palm House, with its wide array of palm trees on display. I enjoy wandering around gardens in my travels, and Kew Gardens is among the best I have visited. Logistics: Kew Gardens, west of central London, is easily accessible by the Underground via the Kew Gardens station on the District Line. There is also bus and train access, as well as a car park for drivers. Kew holds a special place for me because it was the first WHS I visited once I decided to embark on this esoteric hobby. It is also, now I live in London, my local WHS - being only 1.5 miles from my house. I've been a number of times since my first visit, in June 2013, and am now a member (entry is very pricey if you pay the normal entry fee). I'm no herbiphile but it's always nice to enjoy the tropical environment of some of the glasshouses. Look out for the nine Water Dragons that live in the Princess of Wales Conservatory! I revisited Kew in April 2014. My advice to first-time visitors is a) don't be put off by the airliners every 2 minutes - you'll get used to them: b) don't miss Kew Palace - it's tiny compared to WHS palaces like Versailles or Caserta but that's the point, George III lived frugally unlike autocratic monarchs elsewhere (Palace and kitchens now included in the entry price for the gardens); c) avoid the White Peaks café area - the historic Orangery does snacks as well as meals and is quiet and airy. One of the big historic glass-houses - the Temperate House - is empty awaiting repairs to be completed 2018, but the other, the Palm House has been repaired and is open. The Pagoda may disappoint - there is no access and it lost its 80 gilded dragons long ago. The new Alpine House is a tiny gem and the Princess of Wales Conservatory should not be missed. Easily overlooked but one of my favourite buildings is the Marianne North Gallery built in C19 specifically to display the life work of a maiden lady who travelled the world painting plants and landscapes rather well. Finally, of course the plants, trees and landscaping at Kew are wonderful - best to allow a whole day to see it all. There is not much more to add to the other reviews about Kew Gardens - it makes for a very nice half-day excursion from the hustle and bustle of central London (after a while you even forget the planes flying directly overhead). Even if you are not that much into plants and horticulture, this is the one botanic garden in the world that you shouldn't miss. I went there on a warm and pleasant summer afternoon, and it was really nice to take a leisurely stroll through the garden and see the various greenhouses and other attractions. My highlight was the Princess of Wales Conservatory, which includes 10 climate zones from around the world. I also liked the huge Palm House, the Waterlily House, the Alpine House, the Japanese Garden, and the former royal palace with the Queen's Garden. Before leaving, I also enjoyed the views from the Treetop Walkway, 18 metres above ground (even though I cheated and took the lift to reach it...). Liked a spell I followed that lovely peacock until I saw the landmark of this garden, the conservatory building, a masterpiece of Victorian Age. When I entered the building while I was wandered with many beautiful plants, I was upset with the moist that covered my camera lens and my glasses. Then I walked around the garden to see other attractions, I was surprised with the quality of landscape garden, in my opinion, Kew was equally impressive with many royal parks in Europe. There were Chinese pagoda, Chinese lions, Roman temple, bridges and even modern structure to bring me to the tree top observation. It was a great sight to see the sea of violet crocus in almost every corners of the forest garden in early spring with modern art sculptures by David Nash that located in the garden as an exhibition. Another surprised for me was the souvenir shop; Kew had many unique types of merchandise that were perfect for gifts from toiletries like soap, lotion, balm made from lavender, rose and other flower from the garden to kitchenware and stationary. I really enjoyed browsing these products and end up with many gifts to my family and friend. At the end Kew turn out to change my idea on visiting botanical garden. I really enjoyed the visit and after discovered the high quality of the product I bought, I really want to visit Kew to see that peacock and souvenir shop again. 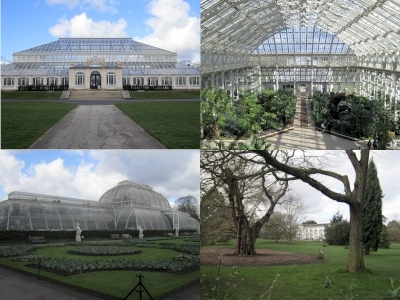 The highlights at Kew Gardens are the two greenhouses from the Victorian period, the Temperate House and the Palm House. Both are marvellous examples of glass and iron structures. The sheer size of the Temperate House is impressive and the diversity of plants is incredible. I liked best to climb the spiral stairs and to walk around the galleries (photo). 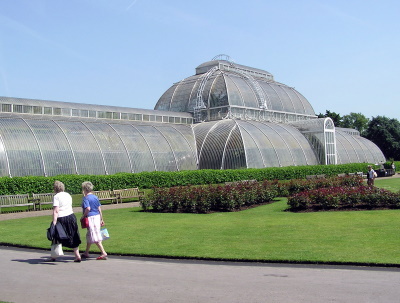 I visited Kew Gardens together with a biologist, which was a double-edged experience. She knew almost all the plants and it was interesting to hear a lot of details about all these exotic species, their habitats and characteristics. On the other hand, it was often exhausting to go just a few steps forwards to the next plant. And now I have hundreds of photos of plants and details of plants on my computer, in addition to the many pictures of the buildings themselves, which I took. Also worth visiting is the modern Princess of Wales Conservatory, which houses plants from ten different climatic zones. It was opened in the 1980s, and it is interesting to compare its modern architecture with the Victorian greenhouses. Not to be missed are the beautiful Waterlily House and the small Alpine House. And I was very impressed by the old giant trees that are everywhere throughout the park. There is also a Royal Palace, the Kew Palace, but we decided not to visit - plants were clearly the topic of the day. For the way back, we took a boat to Westminster. That was very relaxing and a wonderful end of an exhausting day trip. Kew Gardens is one my favourite places in the whole, wide world. I love the plethora of plants, the fabulous flowers, the walks through the different houses that give me different views of different places. I love the Rhodedendron Walk and the huge trees, the panoramas, the bamboo groves, the swaths of daffodils in spring, the Alpine House with all those miniature plants and flowers, including Edelweiss, if you like "The Sound Of Music" and ever wondered, like me, what the edelweiss actually looks like. The Palm House is an extraordinary piece of architecture. I was lucky enough to go to Kew when they had just finished renovating the House but before they put all the plants back, and was able to sneak in there and take some pictures of those lovely spiral stairs. The Princess of Wales House has 10 different ecosystems in it, and I think it is fascinating...I don't know that I will ever get to the high desert in the Andes, but I know what some of the plants there look like! And of course, the tropical rainforest is lush and magical - what a great place to go to when London is grey and dank and cold! Kew Gardens is a magical place, and PBS recently showed an intriguing series: A Year At Kew, that showed some of the things that go on in the background, what it takes to maintain Kew and have it stay viable as a resource. I think well worth going to, and I always visit at least once when I go to London. I visited this site back in June 2005 and I didn't know then that it is WHS. I wanted visit this site because it's the best place to spot wild parrots in London. The garden was beautiful and peaceful place (after you get used to noises from planes), tube station is located near it and I spotted parrots (and many other bird species)! I spent the whole day walking around the park. My favourite part was the pagoda. I felt like I was in China or Japan. A longtime dream turning true: visiting Kew gardens. One day is not enough for an amateur botanist but what can a tourist do? Memories in a couple of words: the royal home is worth a visit, well shows what life was like for the elite way back in time, the exhibition area has always something new to offer, the palm house which is incredibly huge with all the plants you will never see in the wild. The most surprising feature? The airplanes flying low (with the noise which accompanies such a sight) to reach Heathrow. I visited the Kew Gardens in septembre 2009. I particularly liked the glass houses. I loved walking through these old Victorian creations. 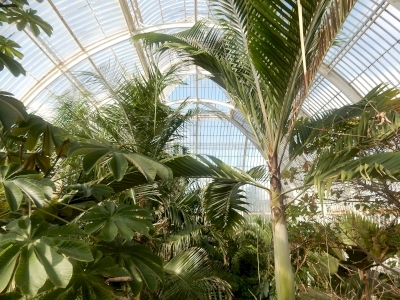 The temperate house even contained plants from the Lord Howe Island world heritage site. I expected more flowers in the park itself but nonetheless I enjoyed seeing this site. It's a very nice place to walk through and to enjoy the scenery. I have been to Kew Gardens twice, once in summertime and once in wintertime. As I come from a country which enjoys exceptionally mild winters I couldn't have really imagined that seasonal differences would be so extreme. But they were indeed. Behold - Do not visit Kew Gardens in the winter! It is a relatively long ride from central London, costly tickets and in the winter, a dreary atmosphere and a vacant expression. Not very rewarding, to say the least. Conversely, a summer visit is a lovely experience! For the merits of the gardens do read other comments. 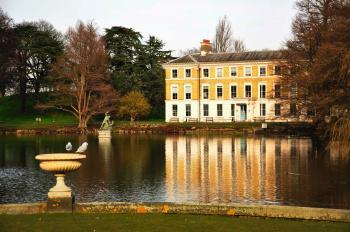 Over the years Kew has been one of the World Heritage Sites I have visited most regularly. Moving from a place I enjoyed for chasing ducks as a child, through to a pleasant garden and on to a site where it is clear to see its role in the development of scientific research. 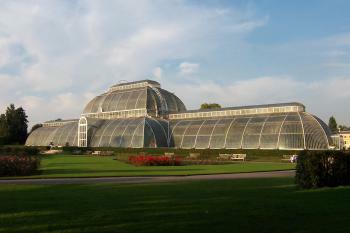 In 2003 Kew became London's 4th (and largest) World Heritage Site. It is set next to the river Thames upriver from central London. The grounds themselves are actually quite expansive and could easily fill a whole day if you wanted to really get into them. The plants are actually rather interesting (even if you are not a keen horticulturalist), and there was enough to see to satisfy me. For me though the main point of interest was the architectural ensemble of the main greenhouses with the magnificent Palm House being my highlight. You will be hard pressed to find better examples of Iron and glass architecture than this, the detailing, especially on the spiral staircases, is magnificent. The other glass houses house some great exhibits, carnivorous plants and the largest flower in the world being two examples and there is plenty here to keep you entertained. Then there are other small little things around, such as a Japanese Garden and a large Pagoda all set in well kept gardens. In the last decade the opening of the wonderful tree top walk has added another interesting element, one that shouldn't be missed. It has helped focus on the arboreal collection as well. Kew has also become great place for Londoners to visit in the Christmas period when the grounds are magnificently lit, though if you are interested you will need a separate night ticket to see them and these are popular so you may have to book in advance. It is very simple to get there from Central London as it has a tube and mainline station nearby and its location on the river means it is also served by Thames ferry service. Additionally it is close to Heathrow Airport, so could be visited if you have a layover there. (You can even, like me, use it as a start or end point of a run that takes in all four of London's WHS, if you have a handful of hours to spare and some shoes that will carry you over the 16 miles between here and Greenwich). It is well worth a visit if you have some spare time and is the sort of place that makes living in and around London so exceptionally rewarding. English garden: "The landscape gardens and the edifices created by celebrated artists such as Charles Bridgeman, William Kent, Lancelot 'Capability' Brown and William Chambers reflect the beginning of movements which were to have international influence." Diplomatic Missions of Joseon Envoy Min Yonghwan: 23 June 1897 (Lunar date: 24/5) Bright. "At 6:00 P.M. together with our official companion, Cavendish, we went to a large park ..Inside the park there was a greenhouse. It was more than ten chang high and was covered with glass. Inside, it was a spacious circular shape with a spiral staircase going upward. There were many rare plants and flowers from every country: azalea three or four chang high, hemp palms, bay trees all several chang high, olive palms, orange trees, mandarin orange trees, and a type of plantain, which were double the usual size." Marianne North: Donated her collection to the Gardens and, during the 1880's, had a gallery erected there to house them (reopened 2009 after restoration). Sackler Family Donation: "The Sackler Crossing"
Modelled after: Chokushi-Mon (Gateway of the Imperial Messenger) is a four-fifths actual size replica of the Karamon of Nishi Hongan-ji in Kyoto. 342 Community Members have visited.